IN A BID to meet dire shortages of health care employees in the Eastern Cape, a new emergency medical care degree will be offered by Nelson Mandela Metropolitan University (NMMU) from next year. The four-year degree, which was given the final go-ahead by the Health Professions Council of South Africa (HPCSA) this week, will form one of the first building blocks towards a fully-fledged Medical School for NMMU by 2020, and offer paramedic students unique training opportunities. Bachelor of Emergency Medical Care (BEMC) students will especially benefit from the university’s location – at the coast and within easy reach of the rural interior – while working in tandem with the pre-hospital Emergency Medical Services (EMS), the provincial EMS College and the city’s six hospitals. Adding to the unique experience will be the integration of students with some of the best volunteer organisations in the country – the metro’s National Sea Rescue Institute (NSRI), the Mountain Club of SA’s Search and Rescue team and SA Lifesaving. These degree students will further benefit from the specialised intensive care programme already offered by NMMU’s nursing department. “The university has a head start with this degree because of the superb combination of being able to integrate our training with voluntary bodies and the medical fraternity in an easily accessible environment,” says programme manager Nico Louw. 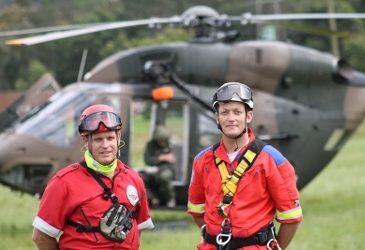 Louw is one of just three graduate paramedics in the entire Eastern Cape. The province only has 51 advanced life support paramedics, of 2 305 nationally. This is a ratio of one to 129 411 patients, compared to the South African norm of 1: 21 258. Prospective students need an Admission Point Score of 36, with English, maths, physical science and life science as pre-requisites to study this degree as it covers both the medical and rescue side of saving lives. “You have to be intelligent, emotionally strong, physically fit and want to serve. There are no trumpets when it comes to saving lives – just the personal satisfaction that you have saved a life. With plans in place to start a medical school at NMMU, the B(EMC) programme will be the only paramedic degree in South Africa to reside hand-in-hand with a medical school, once the new school is established. This is expected to be by 2020, with the first medical undergraduate degree starting in 2018. IMAGE: Prospective Bachelor of Emergency Medical Care student Clifford Hanks, an intermediate life support paramedic (right), accompanied by Nelson Mandela Metropolitan University’s new paramedic degree programme co-ordinator Nico Louw, gets insight into some of the ongoing training that the new degree will offer its students in conjunction with voluntary organisations, like the Mountain Club of South Africa.